CMAST is excited to launch a new feature in our newsletter where we will be highlighting our graduate students and residents working at CMAST. This month we interview Jacob Krause. Describe the path that led you here. I have always been fascinated with water. That fascination lead me to work at a bait shop on a lake near my home in Pewaukee, WI. That is where I got my first interaction with fisherman and learned practical skills such as running boats and using power tools. I went to a small liberal arts college called Wisconsin Lutheran College where I tried a variety of majors like philosophy and business, but I found biology the most to my liking. My advisor saw my enthusiasm and aptitude in aquatic biology and hired me to work on ecological monitoring projects. These included working in electricity generating stations to count fish being sucked into the cool water intakes, assessing invasive plant growth in lakes, and monitoring marine protected areas on the island of Grenada. After my undergraduate years, I spent one year traveling around the world. After returning to the United States, I applied and was accepted at South Dakota State University for master’s work. I worked on assessing the health of small streams based on their fish communities and understanding the ecology of northern pike that lived in those same streams. After finishing my MS degree, I worked a summer with the U.S. Fish and Wildlife Service collecting samples from Lake Michigan salmon that were used to assess the amount of natural reproduction as compared to stocking. That summer, I also applied to North Carolina State University for my PhD to work on weakfish under Dr. Jeff Buckel and Dr. Joe Hightower. For me, the appeal of this project was the people I would work with and the fact that the findings of my research would be used by those that manage weakfish. Weakfish abundance has been in decline for the last 10 years and the reasons for that decline are still unknown. My research focuses on the possible reasons for the decline, which include estimating both fishing and natural mortality. Fishing mortality is estimated from the number of conventionally tagged returned fish from both commercial and recreational fishermen. Natural mortality consists of predation (e.g. dolphins, spiny dogfish, striped bass) or environmental events (e.g. pollution), and can be estimated by tracking fish. 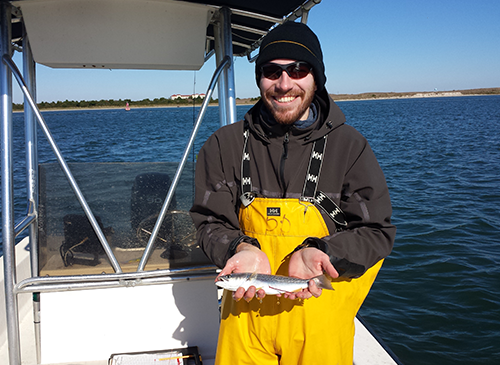 The knowledge gained from this study will allow weakfish stock assessment scientists to better manage the species. I would like to use my expertise and skills to teach at a university and continue my research to answer questions directly applicable to resource management. Where are you in your degree? I am 3.5 years into my degree and I expect to finish in summer 2018. When did you come to CMAST, and what have been some key experiences you’ve had working here? I arrived at NC State’s main campus in August 2013 and moved to CMAST in May 2014. Living and working near the water has allowed me to become more attuned to the happenings in nature around me. So much of my work is tide-, wind-, and temperature-dependent and I have to be constantly aware of nature to safely and efficiently conduct my research. CMAST has been an awesome place to conduct my research because of the proximity to my study sites, the diversity in fisheries projects, and the people who work here.